Go here to view the above image and watch Frances' panel, "Stakeholder Synergies: Socio-Economic Dimensions of Sustainable Agriculture," at approximately 1:33:00 and Straight Talk on GMOs: Fact, Fiction, and Food Security panel at approximately 2:40:00. I spoke in Des Moines, Iowa, last Friday at the World Food Prize, where the day before three biotech scientists and executives, including a Monsanto executive vice-president, received the 2013 honor. Not exactly where you'd expect to see me? 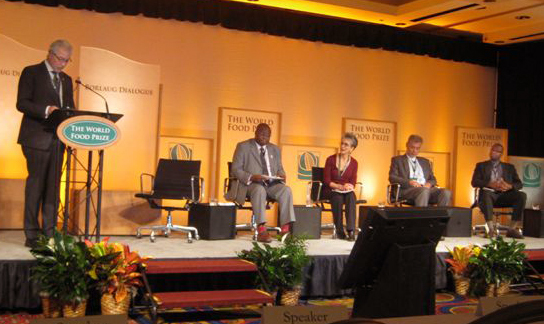 I was there because the courageous, sustainable agriculture leader, Dr. Hans Herren -- 1995 World Food Prize Laureate -- invited me to join his panel. I knew that in the five minutes allotted each panelist, I couldn't change minds. But, maybe, I thought, I could create a moment of dissonance for a few. I chose not to focus on the seed, but on the system it powers. Not only do GMOs not help end hunger, I argued, but they reinforce the extreme power imbalances at the root of hunger. Ambassador Kenneth Quinn, president of the World Food Prize Foundation, deflected criticism that the award is honoring the biotech industry, stating that it is instead "recognizing... basic science." He also assured us that the point of the Borlaug Dialogue, which included our panel, was indeed to engage in real dialogue. You can watch my presentation here. Joining me in talking about sustainable agriculture and how to end hunger were four distinguished colleagues: Hans Herren, Yemi Akinbamijo, M. Jahi Chappell, and Jomo Kwame Sundaram. Our presentations strove to be informative and respectful. We then sat down to listen to the next panel: "Straight Talk on GMOs: Facts, Fiction and Food Security." It was anything but. The panel included: Greg Jaffe, Gilbert Arap Bor, Anne Glover, Sir Brian Heap, and Mark Lynas. Their gist: Anyone who raises questions about GMOs is deluded, having fallen for what Anne Glover called "unfounded propaganda." She went so far as to equate the certainty of scientific evidence about climate change with the certainty about GMO safety. In his opening statement Mark Lynas dismissed Dr. Gilles-Éric Seralini's peer-reviewed study showing worse tumor growth in GMO-fed rats as "utterly fraudulent." Doesn't that qualify as slander? I sat in the first row steaming, aware that sitting next to me was one of the world's most esteemed scientists, Hans Herren, who is precisely the type of GMO critic that the panel seemed to imply does not exist! Later, privately, I told Ambassador Quinn that the tenor of his "Straight Talk" panel, which he publicly called "extremely valuable," was not dialogic but insulting. "As scientists, physicians, academics, and experts from disciplines relevant to the scientific, legal, social and safety assessment aspects of genetically modified organisms (GMOs), we strongly reject claims by GM seed developers and some scientists, commentators, and journalists that there is a "scientific consensus" on GMO safety and that the debate on this topic is "over." ...[S]ome [independent studies] have revealed toxic effects or signs of toxicity in the GM-fed animals. The concerns raised by these studies have not been followed up by targeted research that could confirm or refute the initial findings." If I had known last week what I know now, I would still have focused my five minutes on power, but I would have also said clearly: It is the extreme power imbalances in our world -- exactly what generates hunger amid plenty -- that enables some to ridicule legitimate scientists with impunity. Given this year's award, please join me in asking the World Food Prize Foundation to make three critical improvements to its process -- with the goal of ensuring that such a violation of the Foundation's own vision of nutritious and sustainable food for all could never happen again. And please share with friends and colleagues our GMO factsheet, based on peer-reviewed studies and other authoritative sources -- fully cited on our website. We use rigor not ridicule to make our case. As I stress in my panel remarks, the root of hunger is not inadequate quantities of food but the inevitable outcome of certain qualities of human relationships: specifically, whether they reflect concentrated power and secrecy or inclusive power and transparency. It is the latter that make human dignity, including the right to food, possible.